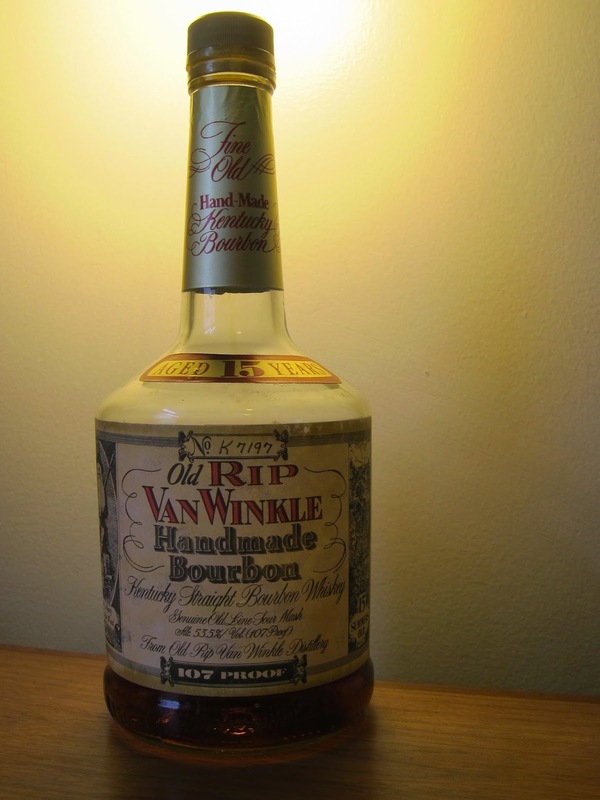 Old Rip Van Winkle 15yo (53.5%): Now, this is a fascinating bourbon to write about... The so called "barrel bottle" sitting on my desk is an Old Rip Van Winkle 15 year old. It is a long gone expression and replaced with Pappy Van Winkle 15 year old in 2004. What makes this whiskey so special for me though is not that it disappeared from the shelves ten years ago but the fact that it is distilled in legendary Stitzel Weller Distillery... Stitzel Weller is a distillery which has the same effect (if not more) on bourbon lovers like Port Ellen has among Scotch enthusiasts. It is a lost distillery which stopped distilling in 1992 after being purchased by Diageo and since then whenever a cask leaves their warehouses for whatever reason (if there are any left...) it creates a small scale mass hysteria among collectors. I have to admit that I got incredibly lucky with this one. Our friend Dave Russo showed up with this bottle in his hand for an American Whiskey tasting we did back in September and somehow I managed to steal the last drops left in it to bring back home after. And now this weekend it is time to say "Happy Holidays to Me..!" Color: Dark amber with a dark orange hue. Nose: Creamy and viscous. Maraschino cherries, strawberry/apricot marmalade and some sweet smoke. Mexican flan and toffee. Water brought up sugar cookie dough and toasted wood aromas. This is such an incredible nose... Palate: A little hot without water. Oak, bitter cinnamon and burnt caramel. Just a few drops of water work like magic: Marzipan, honey rock candies and baklava syrup. Finish: Long(ish) with a slight turn towards salty notes: Roasted pine nuts, salted almonds and cinnamon. Overall: What can I say? It is the best bourbon I tasted this year... So light, elegant but old and complex at the same time. It is sweet, creamy, fruity and so well balanced in every sense of the word it almost feels fragile. I also love the burnt and smoky notes of bourbons from 70's and 80's. Such a unique signature. It almost noses and tastes like pie crust burnt and stuck at the bottom of the skillet. I don't remember getting so much from this dram when I first tasted it back in September after a few cask strength younger bourbons we had on the table. Now with a clean palate it tastes absolutely heavenly... I am still nosing my empty glass. Many many thanks again to Dave Russo for letting me to keep the bottle.